Verizon Communications Inc. has agreed to buy AOL Inc. for a staggering $4.4 billion to enhance their grip on mobile videos and advertising. The acquisition will give Verizon who has set their sight on the crowded online video marketplace new technologies which are developed by AOL for their online video streaming and advertising. 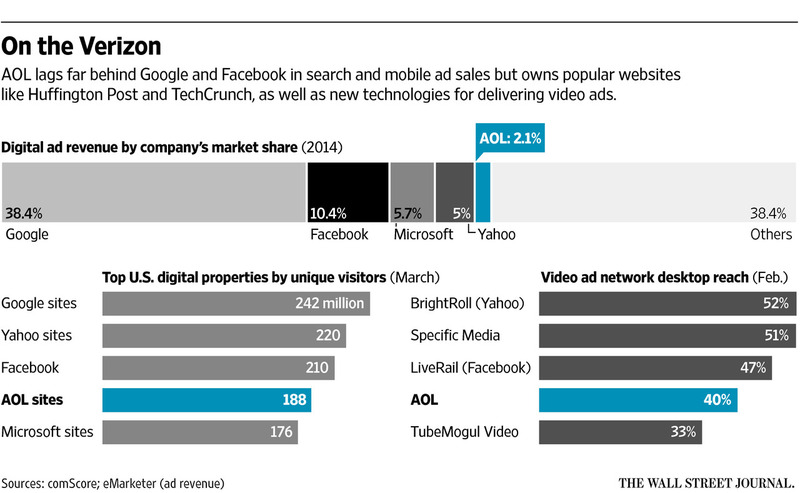 The deal will be done in all cash at $50 a share for AOL valuing the company at $4.4 billion. Verizon confirmed that they have plans to bring in online video streaming option focused on mobile devices and would be based on free,subscription, and ad-based services. Source: Wall Street Journal Verizon already has relationships with many media providers because of its FiOS TV service, which is available in 5.6 million U.S. households. And it has shown prowess in mobile video already, including through a partnership with the NFL that allows it to stream some games over phones. A year ago Verizon acquired the Intel's OneCue internet video service which establishes the company's vision on the online video services. Verizon confirmed that Tim Armstrong will continue to head AOL's operations. Mr Armstrong said that the combination of AOL and Verizon will create the largest mobile and video business in United States and they will be able to fight with the Internet giants like Google or Facebook. The deal is expected to finalize by this summer with Verizon pitching the acquisition with an all cash deal on commercial paper.